COSTA MESA, Calif. -- In a wild scene outside a Donald Trump rally in Orange County, a car began doing donuts around protesters Thursday evening. Thousands flocked to the Orange County Fairgrounds in Costa Mesa to see the Republican front-runner speak, but many others stood outside in protest. Protesters began flooding the streets near the intersection of Fairview Road and Fair Drive toward the conclusion of Trump's rally. 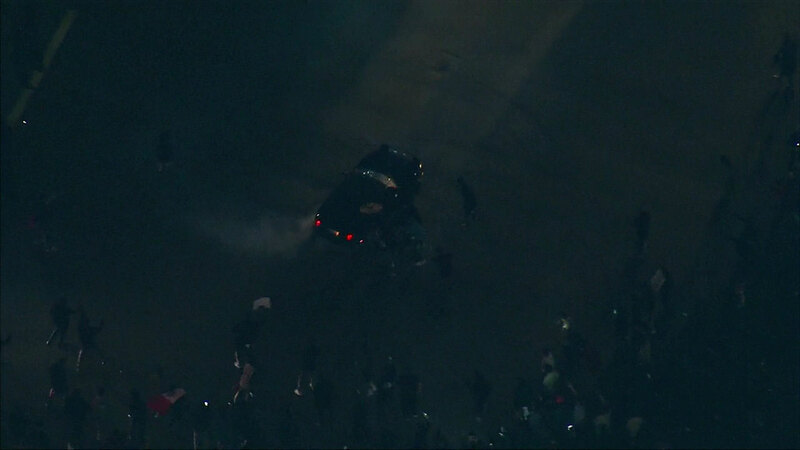 That's when a car began spinning out wildly several times, nearly striking a large group of protesters. Those nearby could be seen jumping out of the way, some appearing to try to hit the car. The car then sped away at a high rate of speed. The scene quickly became chaotic as protesters were spotted attempting to flip a police cruiser. Orange County Sheriff's Department said there were nearly 200 officers and deputies at the site of the protest. Officials ordered the protesters to disperse and many could be seen defying the orders. Deputies confirmed some protesters had been detained or arrested, but could not confirm the number. Authorities urged the public to avoid the intersection of Fair Drive and Fairview Road.